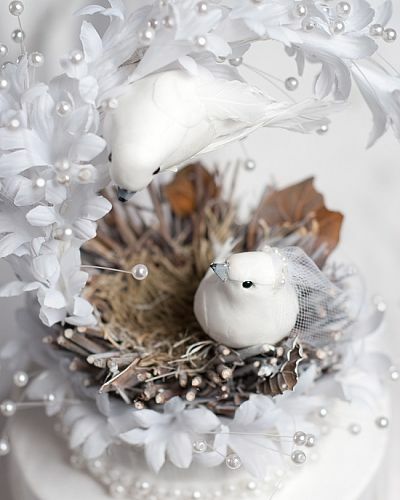 This sweet heavenly love nest cake topper features to adorable birds. The birds are snowy white with feather tails and wings. The groom is perched on a silk and faux pearl arched branch. The bride also wears a delicate tulle and pearl wedding veil and is nestled in a natural twig and leaf nest. The nest resting on a moire and silk base accented with delicate silk flowers and frothy faux pearls.